Originally uploaded by Joe Shlabotnik. My Ex-Bathroom, Forest Hills, Queens, October 16, 2005 - It was good to get away from our renovations for a night. We sealed off the bedrooms nicely, but the rest of the house is hopelessly dusty and dirty. And the only bathroom in the house is through the dust and in the basement. The two-flight trudge down to the bathroom totally reminds us of living in our old Gothic dorms. And I'm even taking a class after work now. All I have to do is join a marching band and I'll be fully reliving my college experience. Sounds just fine to me! The picture is looking down from our third floor ex-bathroom to our second-floor ex-bathroom. Depending on where you stand, you can see all the way down to the ex-kitchen on the first floor, too. I think it's cool, but it seems to bother Sue. 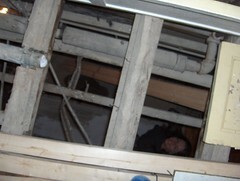 What bothers both of us is that we discovered a leak in the roof after all the walls were ripped out. Just what we needed. But better to find out now, rather than have it leak through our new bathrooms in the near future. Ah, the joys of homeownership.